Marc Jacobs Daisy is my favourite perfume of all time, so when I saw the new Daisy Sunshine from the Eau So Fresh EDT line I couldn’t wait to try it out! As usual with Marc Jacobs fragrances, they have really gone to town on the packaging. The bottle has the signature Daisy covered cap, but this time the colours are much brighter and Summery, which ties in perfectly with the scent. The box is also adorned with matching little daisies in pretty shades of pink, orange and green, and the perfume itself is a gorgeous pale pink colour to it, reminiscent of pink lemonade! Now you will have to bear with me as I am awful with describing scents, but if you have smelled the previous Daisy Eau So Fresh, you will know that it is light and fresh with subtle floral and fruity notes (such as grapefruit, raspberry and apple blossom). The Sunshine release is in the same kind of field, (Daisy, field, get it?) but in my eyes is a more playful, younger scent that definitely takes after it’s name. One spray and you are instantly reminded of Summer. Sunshine still has similar notes such as grapefruit and apple blossom, but this time you get a hit of summer berries which makes this playful scent the perfect Summer holiday fragrance. Usually this kind of vibrant, bold perfume would leave me with a headache and I’d find myself washing it off after a little while, as I really don’t like strong scents on myself, however the beauty of Eau So Fresh is that the fragrances are light and lingering without being too powerful. This bottle will see me through Spring/Summer and the gorgeous packaging will look lovely on my dresser. Have you tried Daisy Eau So Fresh Sunshine? What’s your favourite Summer fragrance? this looks amazing, I think I might have to try this! 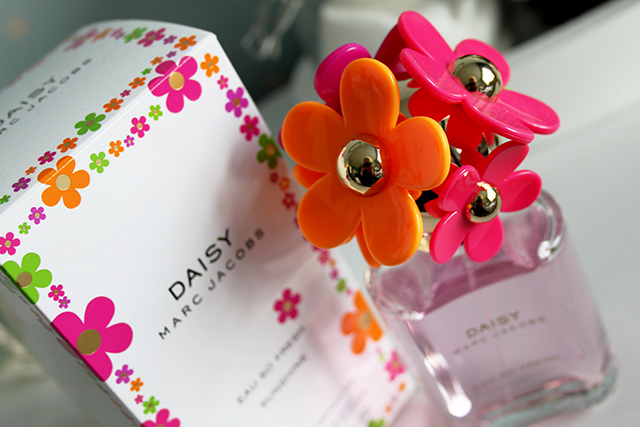 I love Marc Jacobs Daisy perfumes. Ah I love all Marc Jacobs scents! I must try this out! I adore all of the Marc Jacobs fragrances. Daisy is definitely my favourite, its perfect for spring/summer! Dot is also a lovely fragrance. the packaging on this is lovely!